Eating at a full-service restaurant might not be healthier than chowing down at a fast food joint. According to a study recently published in the European Journal of Clinical Nutrition, researchers discovered that patrons tend to devour more cholesterol and salt at “sit-down” restaurants compared to fast food restaurants. The study’s lead author, Ruopeng An, examined the dietary effects of consuming foods at both fast food and full-service restaurants. Using the results from the National Health and Nutrition Examination Survey, over 18,000 individuals provided researchers with insight into nutrient consumption among U.S. adults. 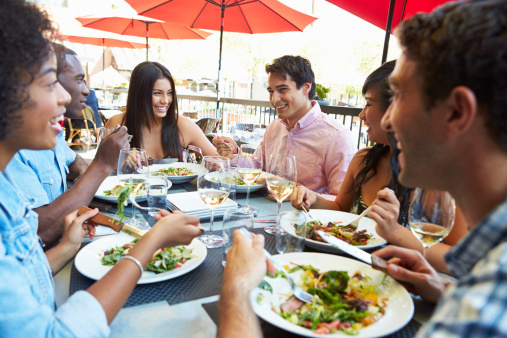 Eating out, regardless of the type of food outlet, was associated with higher calorie intake, as well as a higher consumption of total fat, saturated fat, cholesterol, and sodium. When it came to venue types, fast food consumption was associated with higher intakes of sugar and lower intakes of fiber. Full-service restaurants were associated with an increased intake of omega-3 fatty acids, potassium, zinc, and vitamins B6, E, and K.
Don’t be fooled though—this doesn’t outweigh the high sodium, cholesterol, and saturated fat intake! Nutrient and calorie intake differed by gender, race/ethnicity, education, income, and weight status. For instance, men were found to consume higher levels of calories, total fat, saturated fat, and sodium compared to women. Researchers further discovered that those with less education ate at fast food restaurants more often. Total calories, fat, saturated fat, cholesterol, and sodium levels were higher in obese individuals compared to slimmer individuals. Differences were also evident on the location of food consumption—not just where the food was purchased. Total intake of calories, fat, saturated fat, and sodium were similar regardless of whether the food was consumed at a fast food venue or at home; whereas, total intake of sugar and cholesterol was higher when fast food was consumed away from home. Total calories, fat, saturated fat, cholesterol, and sodium intakes from full-service venues were higher when consumed away from home than when consumed at home. In light of the results, some health experts are recommending that food and nutrition policies incorporate all food outlet consumption outlets—and not just focus on fast food. An, R., “Fast-food and full-service restaurant consumption and daily energy and nutrient intakes in US adults,” European Journal of Clinical Nutrition July 1, 2015; 2015: 1–7. Mozes, A., “Salt, cholesterol consumption higher at sit-down restaurants, researchers find,” WebMD web site, July 10, 2015; http://www.webmd.com/diet/20150710/in-some-ways-fast-food-no-worse-for-health-than-full-service-meals-study?page=1.